Dogged by on and off-field problems, Kenyan champions Gor Mahia saw their CAF Confederations Cup title dream dampened on Sunday evening after losing 2-0 to Morocco’s RS Berkane at the Kasarani Stadium. Gor players had not trained two days before the game, they had played five matches in 12 days and four first team players were missing due to suspension. Nothing was working in their favor and on the pitch, Berkane took maximum advantage to score and put one foot in the semis. Issoufou Dayo and Bakre El Helali scored in either half to hand the Moroccan side an advantage heading into next week’s return leg where K’Ogalo will need a win of three clear goals to go through. Dayo broke the deadlock after 24 minutes, Omar Namsaoui’s well delivered freekick from the right finding the defender insiode the box before he directed it goalwards with the keeper well beaten. Just after conceding, Gor seemed to have woken from their slumber that had seen them start so slow, even the fans whohad thronged the Kasarani Stadium lost their psyche to cheer them on. In the 26th minute, Kenneth Muguna’s short corner was cleared into Charles Momanyi’s pathy, but the defender’s attempt with a volley was awry when he should have controlled and picked his spot. Keeper Abdelaali M’hamdi was to come between Gor and an equalizer making a series of brilliant saves. In the 30th minute, Francis Kahata was cited by a well delivered ball from Dennis Oliech before he drifted back to a favorite shooting position with his left foot, but the effort was smooethered behind for a corner. From this set-piece, Gor won another and Kahat went to deliver, the ball landing on Boniface Omondi whose shot was saved by the keeper. After another minute Gor won another corner, Kahata delivering again but Momanyi’s glancing effort was brilliantly tipped over the bar by the keeper. 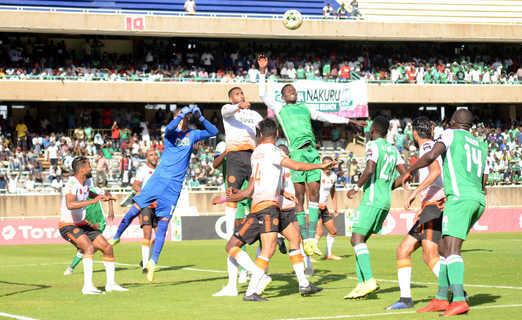 Gor were almost caught on the counter as they pushed in attack, but they had keeper Fredrick Odhiambo to thank after he made a decisive block to deny El Helali after he was put through on goal by Namsaoui. Gor started the second half with an intention of going for the kill and 10 minutes in Omondi had a chance when he cited some good space ahead of him for a shot but his effort went over the bar. Their efforts were however slowed down on the hour mark when El Helali easily turned away from Philemon Otieno off an Namsaoui cross before slotting the ball into the top left corner. Gor made changes, Omondi coming off for Samuel Onyango while Oliech was hauled off for Erisa Ssekisambu. However, they lacked the creativity upfront and Tuyisenge’s absence was loudly telling as they failed to get anything off the home tie.